This month, we are traveling to Sub-Saharan Africa and featuring this regional cuisine to celebrate “Black History Month”, the annual commemoration of the history of the African Diaspora, celebrated in North America during the month of February. For the fourth African recipe of the month, I am taking you back to Senegal, the country where Vera took us two weeks ago with her fried fish balls. 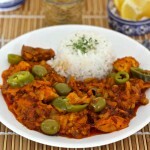 This time, I am presenting what is often considered as the Senegalese national dish: thieboudienne! Thieboudienne, or ceebu jën in Wolof (language spoken in Senegal, in The Gambia and Mauritania), which literally means “rice and fish”. It is also spelled cee bu jen, ceeb u jen, thieboudiene, thebouidienne, theibou dienn, thiebou dienn, thiebou dinne, thiébou dieune, tie biou dian, thieb-ou-ddjien, thiebu djen or tiep bou dien. OK, how about we stick to “rice and fish” if you prefer? 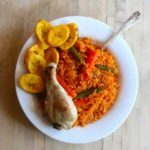 Senegalese thieboudienne is also known in other African countries under the name of “riz au gras” in Côte d’Ivoire or Guinea but also under the name of jollof rice in Nigeria, Mali and Ghana. 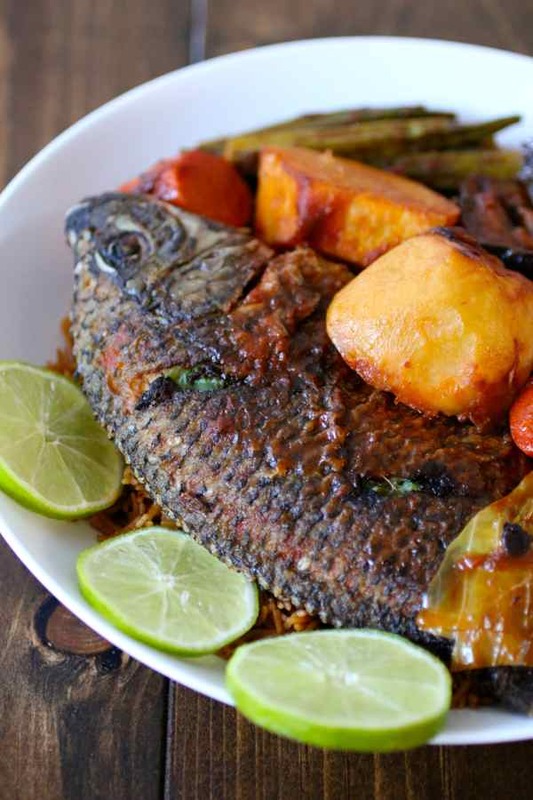 According to the legend, thieboudienne was created, or at least made famous in its current form by a renowned cook of the nineteenth century named Penda Mbaye. There are few traces and verifiable sources of this famous Penda Mbaye but many oral stories talk about her. Penda Mbaye was apparently a waalo-waalo (resident of the historic Kingdom of Waalo centered on the Senegal River delta, around the city of St. Louis) who made her living by cooking for family ceremonies. One day, she had the genius idea mashing cherry tomatoes to use in her cuisine. The success and fame followed after the end result delighted the palaces of Saint Louis. The reason why her thieboudienne now affectionately called thiéboudieune Penda Mbaye by Senegalese, became so successful, is largely due to the fact that the city of Saint Louis was a reference in terms of culture at the time. Indeed, Saint Louis (or Ndar in Wolof) was the capital of French West Africa (Afrique Occidentale Française), one of the oldest cities and most important culturally in Senegal . Speaking of culture and art specifically, do you know what historical event the famous painting by Théodore Géricault, The Raft of the Medusa, on display in the Louvre, supposed to depict? On July 2, 1816, The Medusa, a frigate carrying the new governor of Sénégal Julien Schmaltz, with 400 people aboard to Saint Louis, sank off the coast of Mauritania, running aground in the sands of Arguin, just north of Saint Louis. It is this tragic episode that was immortalized by Géricault. But back to another art: culinary art. The thieboudienne that I am featuring today is a preparation based on fresh fish, guedj, yet, condiments like nététou and rice cooked with vegetables, parsley, tomato, hot pepper, garlic and onion. There is also a variant, made with lamb and jasmine rice that is called thiebou yapp (or ceebu yapp). Let’s talk about all these ingredients, some of which will certainly be unusual enough for most of us. I’m a food adventurer, but I must admit that I did not know most of them until now! Starting with nététou. A funky name for a spice with a very… funky smell, to remain politically correct! It is called nététou in Senegal but you will find this condiment under soumbala (or sumbala) in Guinea or Mali, dadawa, dawadawa or iru in Nigeria or kainda, oji, sungala or sumara in other dialects. Nététou is a major condiment in West African cuisine. It comes from the processing of the seeds of néré, a common leguminous shrub in this region. This locust tree is also called the African locust bean. The pods are harvested in the spring. They are then shelled and pulped. The seeds are washed before being boiled for 12 to 24 hours, and then peeled. The cotyledons are then boiled for 3 hours and then fermented 2 to 3 days before being salted and dried. This is the fermentation that develops this strong smell, the strong flavor and the dark brown color of nététou. This condiment, rich in protein and in minerals, can be compared to the miso paste used in the preparation of miso soup, as it also provides a rather unique umami taste. Another fairly unique ingredient is guedj (guedge or gejj). It is nothing more than salted and dried fish. It may be ground before being added to recipes like in thieboudienne. Regarding yété (or yet), I did not use any in my thieboudienne, but it is often used in traditional recipes of the national Senegalese dish. Yet is mollusk flesh, that is traditionally fermented in the sand. This gastropod mollusk called cymbium, is a kind of sea snail. 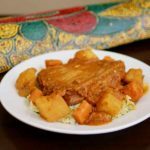 In terms of more “traditional” ingredients, the vegetables used for thieboudienne generally include cassava, pumpkin, cabbage, potatoes, eggplant, okra, carrot and turnip. You may choose to include any of those according to your mood! As far as fish, it’s really up to you! 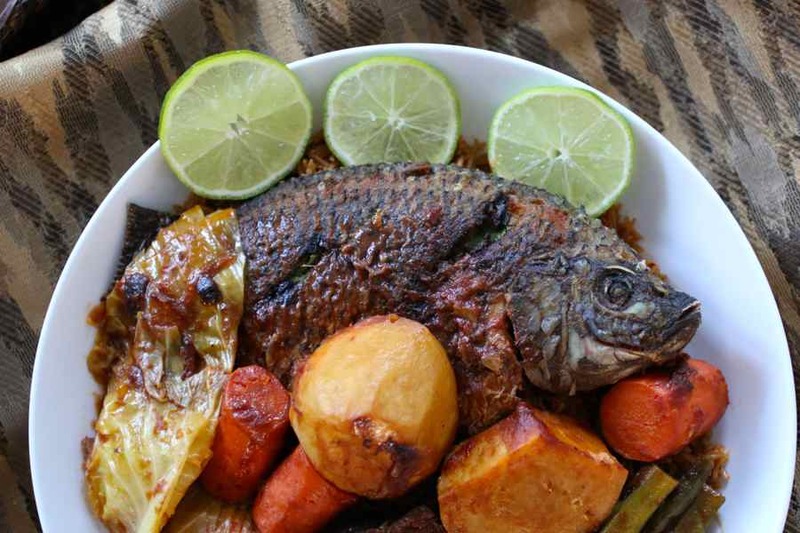 The fish that is typically used in Senegal is thiof, also called white grouper grouper in English but you may use other lean fish with firm flesh, like bream, bass, pike, hake, tilapia or snapper, a fish that Vera had used for her huachinango a la veracruzana. For the rice, broken rice is typically used. Broken rice consists of grains of jasmin rice (or Asian rice) that are broken in the milling process. You should also know that the name of Jasmine rice refers to the color of the rice, which is as white as jasmine flower, not to its flavor! Broken rice is very common in local West African cuisine, but also in Thailand and throughout Southeast Asia. These broken varieties are often less expensive, and are therefore preferred by the poorest consumers. If you can’t find this rice, opt for the classic jasmine rice. I prepared thieboudienne with my friend Betty. Ok, let’s say that I helped Betty prepare the delicious dish of her country. Betty and I were preparing for an African cooking class that hosted Santa Monica. That weekend, we had our practice round and our families were our guinea pigs! 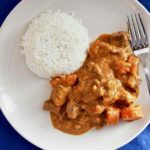 I must confess that of all cuisines, West African and Central African cuisines are by far the ones I master the least, and also those which are probably the least known in the western world. In a big city like Los Angeles for example, there are only 2 or 3 sub-Saharan African cuisine restaurants. To get the rather unusual ingredients, I had to drive to the very few African supermarkets in the city of angels, in the famous South Central neighborhood… a neighborhood I hadn’t had the chance to fully explore just yet! I really have to thank Betty. She finally reconciled me with African cuisine, that we somewhat neglected after our first virtual culinary world tour. Thieboudienne was not only a hit with my family, but also with Betty’s brothers. Gentille and Sandro only had nice words for this version of the dish that reminded them memories of their country. There are some things like this kind of compliment that money can’t buy… for everything else, well, there’s always Mastercard! Thieboudienne Is the Senegalese national dish. 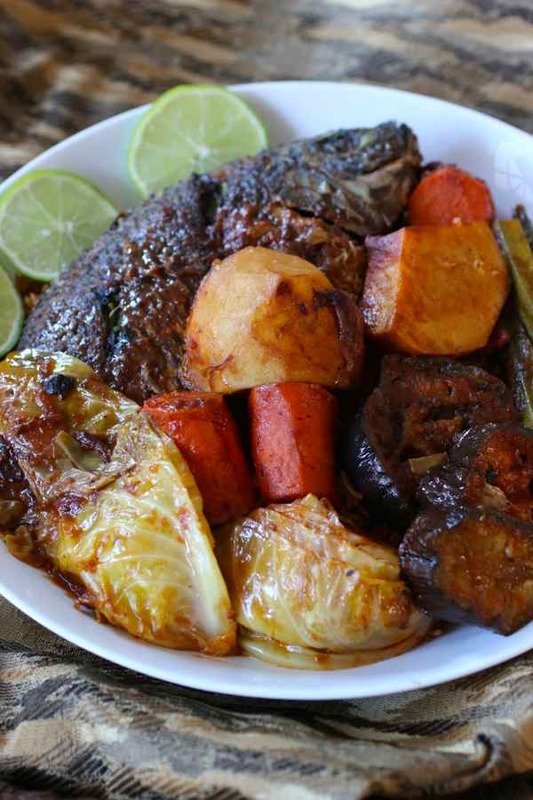 It is prepared with rice, fish, vegetables, tomatoes and various spices like nététou. Prepare fish stuffing. Mix parsley, 2 garlic cloves, shallots, 2 hot peppers, stock cube and salt with a mortar and pestle. Set aside. Clean the fish if necessary. Rinse and dry with paper towels. Make 2 to 3 deep diagonal cuts in each fish. Stuff each fish cut with the mixture. Heat the vegetable oil in a deep skillet. Fry fish for 6 to 7 minutes on each side and set aside. Reduce heat and add the remaining 2 garlic cloves and onion. Add the remaining 2 peppers and mix for 5 minutes. Meanwhile, grind the remaining stock cube, dried fish and nététou using a food processor. 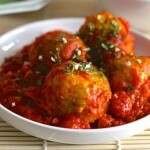 Pour the powder, tomato paste and peeled tomatoes in the pan. Add salt and pepper. Simmer for 5 minutes. Add the bay leaves and 1 cup of water. Simmer for 15 minutes over low heat. Add the vegetables to the pot and simmer for 30 minutes. Remove the vegetables as they are cooked through but still firm and reserve. Add the rice, previously rinsed and add enough water to cover the rice, about 4 cups. Cook 20 to 30 minutes uncovered. Stir occasionally while cooking. Add the vegetables and fish back to the pan and cook for an additional 5 minutes. Place rice and vegetables and fish pieces on each plate. Serve hot with lemon slices. Hello! Thank you for the recipe. I love thieboudienne but have only had it in Senegal. I would love to make it since we don’t have any Senegalese restaurants in Dallas, T.X. 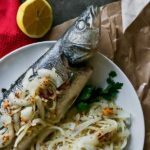 Where in the USA can I buy nététou and small dried fish (guedj)? Hey Tam, I live in Los Angeles, and I was only able to find those ingredients at an African market. Good luck! I wish it offered more insight into what goes into it. What do you mean, Cathe? 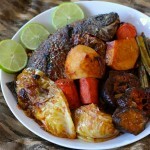 I’m doing a lot of research for a project on West African cuisine and your write up of this dish was great! Thanks for including the background on the dish as well!